Families of missing and murdered Indigenous women and girls now have an advocate to help them find information and resources related to their loved ones. L-R: Don Langford, executive director, Metis Child and Family Services Society; Janice Randhile, Family Information Liaison Unit staff member, liaison for southern Alberta; Richard Feehan, Minister of Indigenous Relations; and Sarah Hoffman, Minister of Health and MLA Edmonton-Glenora. 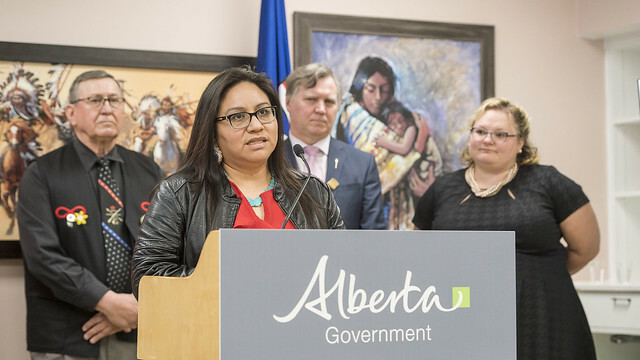 As part of its commitment to the National Inquiry into Missing and Murdered Indigenous Women and Girls, the Government of Alberta has established a Family Information Liaison Unit with approximately $1.5 million in funding from the federal government. The unit is intended to be a single point of contact where experienced front-line staff can provide families with information about the justice system and legal processes, as well as specific updates about criminal investigations, court proceedings or fatality inquiries involving their loved ones. The team can also link families with Elders, spiritual support and counselling. A group of Elder advisers will also be available to assist staff and help ensure families are treated in a way that recognizes and honours their Indigenous traditions and beliefs. Three members of the team are based in Edmonton, with a fourth in Grande Prairie. Face-to-face meetings are important to many families and the liaisons will travel throughout Alberta to see people in their home communities. Funding for Alberta’s Family Information Liaison Unit is for three years, running concurrently with the National Inquiry into Missing and Murdered Indigenous Women and Girls until March 31, 2019. To contact the Family Information Liaison Unit call 1-780-427-3460 or the Government of Alberta’s toll-free service at 310-0000. In August 2016, the federal government set aside $11.7 million for the provinces and territories to establish units across the country during the National Inquiry into Missing and Murdered Indigenous Women and Girls. Last September, Alberta made its commitment to the inquiry official with an Order in Council enabling the commission to access Alberta records helpful to the inquiry. On May 1, 2017, Justice and Solicitor General sent in an Application for Standing to enable Alberta to participate in the hearings.